For those that are not located here in the Omaha metro area, here is your weather report…we experienced dense fog from Sunday late afternoon through Monday overnight. It seemed to just linger and hang there and just wouldn’t go away. It caused limited visibility, lack of energy and motivation and even some down and depressed moods. Well, that is what I feel like today and the fog outside is gone. – My maternal grandfather was hospitalized battling prostate cancer and heart issues. I am sure I probably forgot something, but you get the gist of what the last 13 months have looked like for us. So my analysis is that my mind and body are experiencing an overload of everything and trying to process the stress and that is causing the fog that I am in. We all have known and been expecting “the end” with my paternal grandfather, but I think that with that end being so near now that it is causing me to relive everything that has led up to this. So if you are one of the lucky ones that gets to interact with me, I apologize if I seem to be in a funk or a fog so to speak. I am doing my best to maintain a positive attitude and a sense of normalcy for my children and for the sake of my work but I am sure that all will notice that I am just not quite “myself” today. So I will “hug-a-mug” and try to refocus and work on the things I love…helping others acheive a healthy and happy life! I am very excited to have so many great programs starting back up (and even some new ones happening) at work! Make today a fantastic day!! Last Friday evening my family and I were blessed greatly to witness and share in a very special moment between my youngest son Liam and my paternal grandfather. Now to understand this moment a little better, I am going to share a little back-story information with you first. In mid-December of 2011, my grandfather was in a car accident which broke his neck and landed him in the hospital with a trach and on a ventilator. He has been in the hospital and/or long-term care ever since with limited mobility/function in his arms and he is still on the ventilator. Last Tuesday he was transitioned from traditional medical care to hospice care. After being in this situation for over a year, his body is beginning to shut down and he has decided that fighting so hard is becoming increasingly difficult. Sadly, the plan now is to just keep him comfortable and let nature take its course. So, my parents, brother, sister, husband, our youngest son Liam and I all went to my grandfather’s long-term care facility Friday night for a visit and to essentially say “good-bye” to him. My grandmother (his wife) is currently in the same long-term care facility with health problems of her own. She was excited to see us all and joined us in my grandfather’s room for our visit along with one of my uncle’s and aunt who were there eating dinner with my grandmother. Liam was sleeping in his carseat when we arrived and about 10 minutes in to our visit began to awake and stir. So I removed him from the carseat and took him over to my grandfather’s bedside to introduce him to his newest great-grandchild. My grandfather’s face lit up and he even had the slightest hint of a smile on his face! He reached up and grabbed Liam’s little hand and the two of them sat and stared smiling back and forth at each other for several minutes. It was like they were in their own little world. Neither could speak, but they communicated with each other just fine. I may be mistaken, but I think I even saw a tear form in my grandfather’s eye. I saw one man coming toward the end of his time here on earth reflecting on all that he has accomplished and another little man just beginning his journey with endless opportunities and possiblities ahead of him. And then it dawned on me…one of my grandfather’s accomplishments was my son, his newest great grandchild…for from my grandfather and grandmother came my father and from my father and mother came me and from my husband and me came this sweet baby. Without my grandfather none of it would have been possible. To me personally, that moment was a painful yet beautiful reminder that with every end comes a new beginning. So the next time you are grieving an end…remember to also celebrate the new beginnings, whatever they may be. I love you and will miss you. You have taught me incredible determination and perseverance watching you fight through this journey for the last 13 months. I promise you will live on through the memories, stories and pictures I share with my children about you. Remember you need support in every journey you have..
Well you are…don’t give me that face! This saying rings true in many ways in our lives, but I find it is very much true in our health and wellness. I heard a speaker today discuss tips on organizing our lives and something she said really stuck with me. She said that when it comes to time, there are overestimators and underestimators. Those that underestimate time tend to be late because they will begin a project and it will take longer than they expected. Those that overestimate time tend to look at a project (folding laundry was the example the speaker used) and get overwhelmed by the amount of time they think it will take and they will ultimately end up putting that project off until a later date/time because they think they don’t have time for it ‘right now’. I see this ALL the time with people and their health and wellness! I really think that a large majority (if not all) people tend to overestimate the amount of time and energy that living a “healthy lifestyle” will take. I know you have heard it before and you probably hate hearing it again, but really all things in moderation really is the way to do it! One thing I hear over and over again from my clients is that they just don’t have time to dedicate to exercise so there is no possible way that they can get in shape or lose weight or get healthy. Poppycock I say! (excuse my language ;o) There is ALWAYS time for activity in your life…yes I said ALWAYS! Do you talk on the phone, do you watch television, do you do laundry, do you stand in lines, do you park your car in a parking lot? Well do you, do you, do you?! If you did not answer yes to at least one of these things…I am sorry, you are either lying or you hire somebody to live your life for you! We all have these activities of daily living that we do. And those activities are the answer to sneaking extra “exercise” activity into your day! I will give you the secret…shhh, don’t tell anybody…wait…yes, tell EVERYBODY! * When talking on the phone (at work at your desk or at home or wherever you may be) stand up. Yep, stand up! The act of simply standing versus sitting can burn approximately 50 more calories per hour! * When watching television do the tv workout! What is that you say? That is the beauty of it…you can create your own! But the jist of it is that you just MOVE while watching your television program!! If you still watch live tv and have commercials, do activity during the commercials. Run in place, sit-ups/crunches, push-ups, planks, jumping jacks, etc. In a 60-minute program you can get approximately 20 minutes of activity in just during the commercials!! * If you carry your laundry from one area of the house to another, make a couple extra laps with the laundry basket before you drop it off in the laundry room to sort it. It will only take a couple of minutes, but you are burning extra calories!! * Standing in lines is my favorite! While standing in line, you can do “calf-raises” by simply standing up on your tippy-toes and then standing flat-footed again. Repeat that until you get to the front of the line! * When parking, especially on those days when the weather is beautiful, park further away and make that walk into the store. I know we all try to park close to save time, but in reality it takes longer to drive around and find a close spot or wait for somebody to walk to their car and leave than it does to walk from a further spot! * Finally, take the stairs!!! Pretend the elevators are broken in every building! Now I too will use the elevator when I have to go up many floors…let’s face it, stairs are hard! But if it is 5 floors or less, I will try to use the stairs! Remember, you CAN do it, you ARE worth it and wellness really DOES work! We hosted our first sleepover this weekend! It was a momentous occasion because with 4 kids, I am sure that this is the first of many, many sleepovers to come! Our first sleepover guest was my son Logan’s bestest friend in the whole world, Claire! Logan and Claire are both turning 5 this spring/summer and have been best friends since they were born. The kids were ecstatic for the night…so much so that my second-born Austin woke up at 6:45am Friday morning asking if Claire was “here yet”. To them, waiting all day seemed like forever! But the time finally arrived and Claire came through the door and they were off! With hardly a word to anybody, the kids were off playing happily as soon as she arrived. A great start! Claire’s 2 younger brothers accompanied their mom to drop Claire off at our house and their second-born (2.5 years old) was very upset that he wasn’t staying with us as well. However he also didn’t want mommy to leave him so we knew it wouldn’t work to have him stay. So after a tearful good-bye from him, and hardly any good-by from Claire, her mom and 2 brothers headed out leaving her behind for her first sleepover as well. The kids played Power Rangers and Pirates and then watched a Strawberry Shortcake movie. Then it was time for dinner…pizza of course! After dinner the 4 kids (my 3 oldest and Claire) enjoyed playing a rousing game of Sorry Sliders before we settled down to watch a few kids shows to wind down before bed. Around 10pm we laid out the kids’ sleeping bags in the living room and I took my place on the couch for a night of indoor “camping”! My husband Todd and our newest little guy Liam stayed upstairs in our bedroom while I stayed down with the rest of the rugrats. My little princess Lexie had a hard time trying to sleep with others around to talk to so she ended up back in her crib in her room where she is most comfortable. Besides one incident around 1:30am of a little one getting lost on the way to the bathroom (no accidents, just a few tears from being scared and confused), the night went great! We made pancakes for breakfast and then played with play-doh until Claire’s mom came to pick her up. The most difficult part of the sleepover was Claire having to go home…none of the 4 kiddos wanted that at all! I would say that it was a success and the boys are excited to go over to Claire’s house to have a sleepover there with her and her brothers! In fact, they wanted to do it right away Saturday night…gotta love a timeline of a kid’s mind! We all have them. Moments or days or, heck even weeks, where we feel stressed and overwhelmed and need to stop to take a deep breath or two…or ten. The truth is that while those breaths do help, they don’t really do the trick. So what do you do so you don’t blow your lid and make things worse? First use the deep breaths to get you through the immediate situation and then as soon as you are able to, remove yourself from it. The sooner you can get a moment to yourself, the better! Next, do what you can to calm yourself down. Now what you do here depends on you and what works best for you. For some, thinking through the situation or talking it through helps. For others, the more you think about it, the more upset you can become so a better action may be distraction! Do something that will help take your mind away from the situation for a moment. Read a chapter in a book, write a blog, check your facebook, go for a run or a walk, play a game…you get the idea! Do something that you enjoy to get those endorphins released. Finally, when you are feeling more calm and relaxed, think through the situation again and attempt to resolve whatever is left of it so it doesn’t continue or happen again. I know this is always easier said than done, but it doesn’t hurt to try! Dress for success, dress to impress, dress comfortably, etc. With all of these sayings (and more)…which one should you listen to, which one is correct?!? Dress for you! What makes you feel happy, confident, beautiful/handsome? That is what you should wear! There are days I will wear a suit coat to work…not because I have to, but because I want to feel more professional that day. Or I will wear something that is a fun, bright color or sparkly on a Monday. Fridays are naturally sparkly days…Mondays need a little help…so wearing something sparkly helps me remember to stay “sparkly” too! So when you are picking out your outfit for the day…think about how you want to feel that day. If you want to wear a beautiful gown on a Wednesday…do it! If you want to snuggle on the couch with a good book and a cup of hot chocolate…then you rock those comfy sweats! Just remember that you are dressing for you and not anybody else. It doesn’t matter if you impress anybody else. All that matters is how it makes you feel!! Make today amazing…only you have that power! 2 Comments on Dress for…You! Well, I haven’t blogged since Friday and it seems like forever ago! The weekend was a busy one for us…we held a combined birthday party for our son Austin (3) and our daughter Lexie (2). 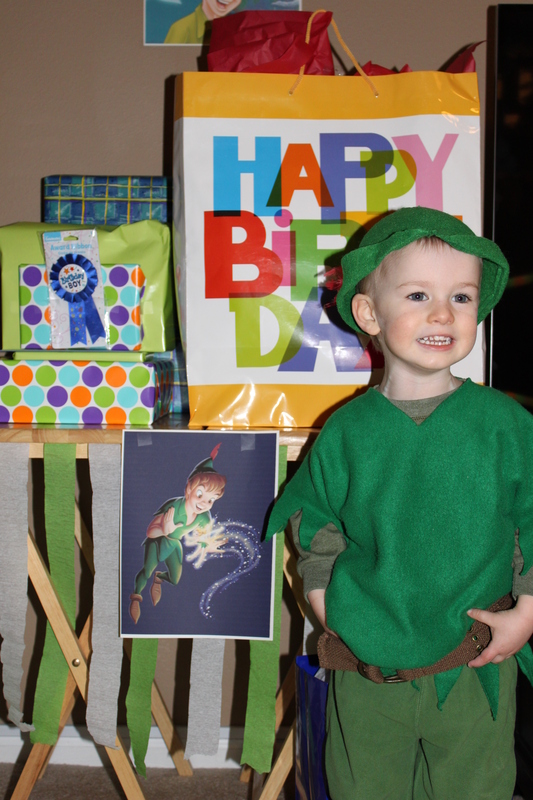 They wanted a Peter Pan/Tinkerbell party. Sounds easy enough, except for the fact that there isn’t anything Peter Pan out there anywhere! You can find a lot of Tinkerbell decorations and lots of Jake and the Pirates stuff, but nothing with Peter Pan on it. So we improvised! Below are some pictures of what we did to help all you parents out there that may need some ideas for your little one! We used a green tablecloth and green napkins for Peter Pan and incorporated pink in for TinkerBell. I found some cute TinkerBell table decorations at Target and then printed a couple of pictures of Peter Pan to tape on to them. I had some leftover pirate-themed and Jake and the Pirate decorations from my oldest son’s party last year so we used some of those things as well. We placed 2 tv trays up to place gifts on for each child. On those trays I printed off pictures of Peter Pan and TinkerBell and added green and white streamers for a little flare! This helped our guests know where to place the gifts and helped keep things separate for Austin and Lexie so they still felt special on an individual level instead of just combining everything. 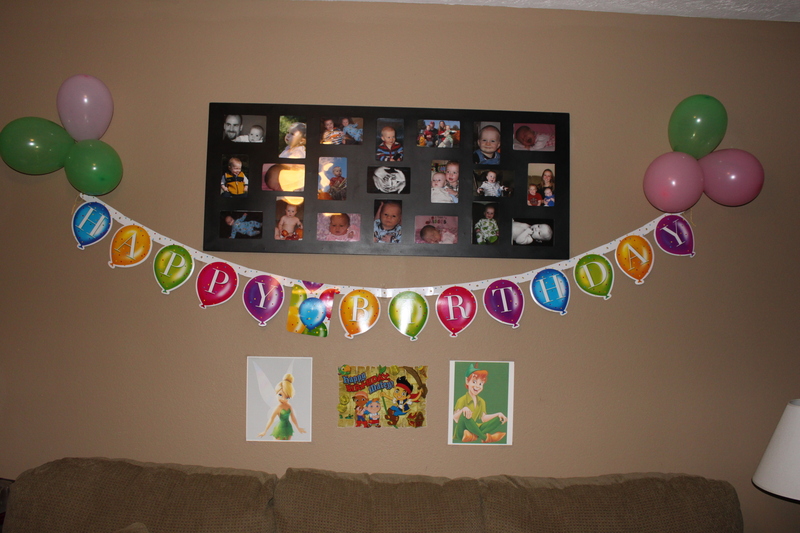 We hung Happy Birthday Banners all over the house and had pictures of TinkerBell, Peter Pan and even some of Jake and the Pirates and Captain Hook (with Peter Pan) scattered throughout. We also added a few balloons as well. Our oldest son Logan got in on the fun as well and dressed up as a pirate! It was a great day with family and friends and the kids had a great time! All in all…a success!! Austin even said…”this is the best birthday ever!” That is all this mom needed to hear! Thanks to all that attended and helped make the day so special! I attended a memorial service for my Aunt Sue today…a day that would have been her 64th birthday. She donated her body to science so it was not a formal funeral, but a beautiful service and family gathering to honor and remember her and to celebrate her life. I am so very proud of her for donating her body to science. I only hope it helps the doctors learn more about and maybe even find a cure for the disease that took her life. All of this started the thoughts turning in my head…more so than normal! I started thinking about what will things be like when I am 64. Will I live to 64? Life is so very short and my own personal recent experience has solidified that concept even more for me. Remind me to share that story with you later… Without getting into details now, let’s just say that I am very blessed to be here today. So, with that thought (that life is short), I can’t express enough to everybody to find your “happiness” whatever it may be. Don’t “settle” for anything. If there is something in your life that you are not happy with…change it. You alone hold the power to make your life satisfying. Don’t like your job? Hate going to work every day? Then figure out what you want to do, what will make you happy and pursue it. Maybe it is a different company to work for, maybe just a different position in the same company, or maybe you just need to talk to your manager and see if your position can be tweaked a little to make you happier! Finding yourself in a rut? Unhappy with your day to day? Find something that makes you happy that you can add to your day. For me it is playing a game with the kids and acting like a kid myself. Or some adult social time…that is always nice! I have found great joy in blogging and that has served as a great “therapy” for me every day! And then there is my “hug-a-mug” time. This term I stole from a friend of mine and it is a part of EVERY day for me! A hot beverage (yes, this is a Sheldon Cooper reference! :)) and at least 5-10 minutes of “me” time to sit and “hug” the mug while drinking said hot beverage is an essential part of my day. At least it is if I am going to be in a good mood…LOL! Make today a fantastic day and I leave you with the hopes and wishes that you each find your happiness!